Bank of America on Thursday agreed to pay $16.65 billion to end investigations into that the bank and its units sold in the run-up to the financial crisis. The settlement announced on Thursday by the U.S. Department of Justice calls for the second-largest U.S. bank to pay a $9.65 billion cash penalty, and provide $7 billion of consumer relief to struggling homeowners and communities. It is expected to resolve the vast majority of the Charlotte, North Carolina-based bank’s remaining liabilities tied to its purchases of Countrywide Financial, once the nation’s largest mortgage lender, and Merrill Lynch. “This historic resolution—the largest such settlement on record—goes far beyond ‘the cost of doing business,”‘ U.S. Attorney General Eric Holder said in a statement. Chief Executive Brian Moynihan has spent more than four years trying to rid Bank of America of liabilities from the purchases of Countrywide and Merrill, which were made by his predecessor, Kenneth Lewis. In a statement, Moynihan said the accord is in shareholders’ best interests. Shares of Bank of America rose 11 cents to $15.63 in early morning trading. The settlement’s outlines had surfaced earlier in the month, and the formal announcement may increase the chance that many of the bank’s mortgage problems are behind it. Bank of America admitted having sold billions of dollars of risky mortgage-backed securities while concealing key facts about the quality of the underlying loans. It also admitted to having made misrepresentations to Fannie Mae and Freddie Mac about the quality of loans sold to those government-controlled mortgage companies. The settlement resolves pending and potential future cases by the Justice Department, the Securities and Exchange Commission, the Federal Deposit Insurance Corp., the Federal Housing Administration and several U.S. states, including over activity since Countrywide and Merrill were bought. It does not cover the $1.27 billion fraud penalty imposed last month by a federal judge over a fraudulent Countrywide mortgage scheme known as “High Speed Swim Lane,” or “Hustle,” which Bank of America is appealing. The accord also does not cover potential criminal claims or claims against individuals. 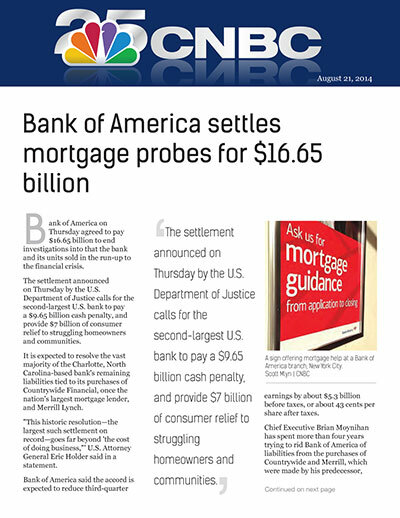 Including the latest accord, Bank of America will have paid well over $65 billion to resolve mortgage issues with consumers, investors and government agencies tied to its purchase of Countrywide in July 2008 and Merrill six months later. The $16.65 billion settlement eclipses the respective $13 billion and $7 billion accords that JPMorgan Chase and Citigroup recently reached to resolve similar claims.